OSSIPEE, N.H. -- As a technology entrepreneur who has founded three online companies, Andrew Hemingway, 32, is no social media novice. Still, even the most Internet-savvy millennial isn’t immune from the occasional digital mishap. It’s just that for Hemingway, who is running for governor of New Hampshire, the repercussions are higher than for most of his peers if a point-and-click goes awry. It is not often that someone running for statewide office shares with a reporter potentially embarrassing stories like this one. But Hemingway is the rare office-seeker who talks the same way when a digital tape recorder is in plain sight as he does in off-the-record conversations. He has, after all, lived the entirety of his adult life in the era of over-sharing. With his ardent small-government views and outsider bona fides, Hemingway brings a distinctive perspective to the governor’s race here. And as a candidate born during the Reagan administration, he is offering a glimpse at how a new generation of political contenders may soon be campaigning with a different mindset than the one that often prevented their predecessors from saying much of anything interesting. “I’m the first millennial to run for governor in the country,” Hemingway noted as he drove past Lake Winnipesaukee on the kind of late-June evening when pastoral New Hampshire is at its most inviting. If elected, Hemingway would become the youngest governor in the state’s history and be the same age Bill Clinton was when he first took the reins in Arkansas in 1979. Hemingway is a full decade younger that the nation’s current youngest governor, South Carolina’s Nikki Haley, and he doesn’t even look his 32 years. “I’ve fine-tuned it,” Hemingway said of his canned laugh lines. But really, there’s not much else that is fine-tuned about him. His lack of polish makes for a stark contrast with his would-be opponent, Gov. Maggie Hassan. The 56-year-old Democratic incumbent offers in spades the “message discipline” that campaign operatives love and voters have come to expect. In a recent interview that took place after she addressed students at a Rochester elementary school, the first-term governor answered four separate questions related to her re-election campaign with nearly identical, pre-crafted talking points, no matter what the query. “I’m just focused on making sure that we’re working every day together to advance the priorities of the people of New Hampshire,” Hassan said when asked about New Jersey Gov. Chris Christie’s visit to the state that day on behalf of one of her GOP opponents. Though revealing little of Hassan’s mindset, these canned responses were indicative of a seasoned politician who is more than 20 points ahead in most polls and unwilling to risk making even a small mistake by being more forthcoming. Hemingway, on the other hand, is in the opposite position: He has nothing to lose. He is running against fellow businessman and political novice Walt Havenstein, 65, in a two-candidate Republican primary. Christie -- the chairman of the Republican Governors Association -- recently traveled to the state to endorse Havenstein, who was recruited into the race by influential New Hampshire Republicans. In keeping with his role as the GOP front-runner, Havenstein has sought to keep the focus of his campaign on Hassan, rather than on his primary opponent. Asked in a brief interview about the relative youth of his GOP adversary, the avuncular Havenstein did not try to make it an issue. Hemingway may be the underdog, but his candidacy is not necessarily quixotic. A longtime Tea Party activist, he has deep ties to the state’s many grassroots conservative organizations and has experience at the upper echelons of New Hampshire presidential politics, having run Newt Gingrich’s 2012 campaign in the state. And Havenstein has at times been shaky on the stump since announcing his candidacy in April. Even some of the front-runner’s allies concede privately that the outcome of the September primary is in doubt -- not that Hemingway cares very much what they think. 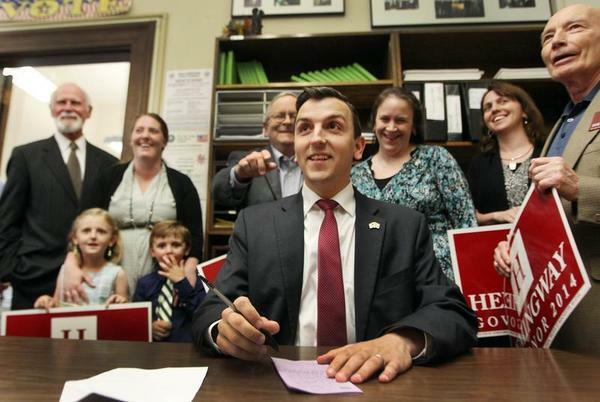 Instead of first running to become one of New Hampshire’s 400 state representatives or working his way up the Republican Party ranks in the traditional manner, Hemingway simply declared his candidacy for the state’s highest office. That rubbed many longtime New Hampshire GOP power brokers the wrong way, according to Hemingway. To the extent that it is feasible, Hemingway has sought to turn his youth into an asset, presenting himself as a fresh face to confront New Hampshire’s challenges and spending more time on college campuses than is typical for a gubernatorial candidate running in a non-presidential year. “They’re often surprised because they go, ‘He’s almost my age,’” he said of responses to him from the 18-to-22-year-old crowd. Though he purports to have already made noticeable inroads with young voters, Hemingway knows he won’t get very far in a GOP primary without earning the support of the AARP set. At a Thursday night meeting of the Carroll County Republican Committee here in this Lakes Region town of less than 5,000, the prevalence of white hair among the 31 people on hand was a reminder of who the most engaged voters in midterm elections tend to be.